Learn how Process.Net allows you to depict processes transparently and in simple, well-organized structures, allowing you to understand, enter, and continually optimize important data. Learn how QBD.Net allows you to create, maintain, control, and archive all your documents with just one program. Learn how Qualify.Net supports you throughout the planning, administration, documentation, and evaluation of all training and qualification matters in your company. Learn how JobControl.Net enables you to practice continuous and comprehensive status monitoring and track the processing state of automatically initiated or manually delegated tasks. Learn how SRM.Net enables you to systematically and effectively manage all your supplier relationship matters via hard and soft facts, expressive indicator values, and system-wide data. Learn how to use QAM.Net in order to conduct efficient and effective audit management and model any process, product specification, or system detail of your company or area of responsibility. Learn how Change.Net provides you with a comprehensive overview of all change processes in your company and how it ensures that modifications made to products and processes are conducted in a controlled, coordinated, and cost-efficient manner. Learn how Success.Net supports you throughout the definition, planning, acquisition, evaluation, as well as target-group visualization and reporting of key performance indicators and objective agreements. Learn how QDrive.Net displays all occurrences of selected data in your modules and highlights the individual correlations in one powerful user interface. This course aims to increase the participant’s overall proficiency in working with the CAQ.Net® quality management modules on a day to day basis. 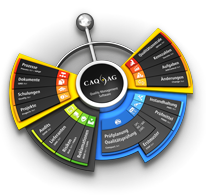 All users of the respective CAQ.Net® quality management modules.